Product #3178 | SKU ADI648 | 0.0 (no ratings yet) Thanks for your rating! The ADI-648 is a sixty-four channel format converter from MADI to ADAT and vice versa. MADI handles sixty-four channels of 24-bit audio at sampling frequencies up to 48kHz and thirty-two channels up to 96kHz. All channels are transferred across a single cable, using either a coaxial (BNC) or optical network cable. The ADAT channels are provided via eight TosLink optical inputs and outputs, respectively. 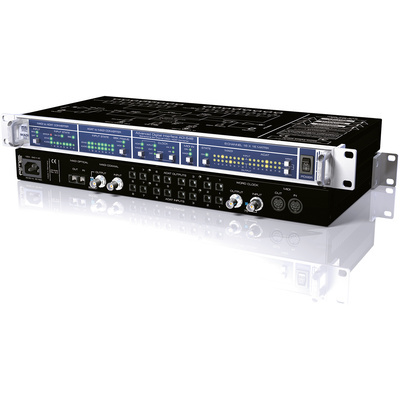 Amongst other applications, the unit can serve as an MADI front-end for RME's Hammerfall and Hammerfall DSP series. An easy-configurable eight-channel 16x16 Matrix Router can assign any of the outputs, which are divided into eight-channel blocks, to any eight-channel input block, both on the ADAT and the MADI side. In addition to the routing within the MADI/ADAT conversion, the unit also performs splitting and routing within the same format. When the single-space rack-mount unit is serving as a format converter, cable lengths of more than 100 meters can be achieved. The ADI-642 accepts both fifty-six and sixty-four channel standards as well as 96k frame at its input and can be set to generate both these formats at its output. This way the ADI-648 can serve as an interface between otherwise incompatible MADI devices.